Good to have you back, Tottie. And glad you were able to upload that dear ghome-ish photo with the beautiful cactus in the background. I’ll send “release” energy to the customs folk on your behalf. Thanks Aleksa! I love it when the Christmas cactus is in bloom- summers here are short and winters long, so I really really need indoor blooming plants! And, happily, the customs folks eventually released the other loom, which I love, and have taken pictures of, but sadly, can’t seem to get them to upload! fiddlesticks! My goodness, you’ve been busy! I just took a quick look at the looms link… I think I need to go Christmas shopping for myself! Oh, yes, looms are always the perfect gift! And, the best thing about small looms is that they are so much more affordable than large ones… plus you have the added bonus of them being so portable! Thanks, Alice! We’re having technical problems, and I don’t seem to be able to upload right now, so are working on figuring that out…. arghh…. So glad you are back. Love the inkle loom. I have not done any “inkling” in years. Have been using the weavette. Count so far is 425 squares….lol..now to put them together. I bought a backstrap loom but have not had a chance to start yet. I want to get Waddington’s book also. Her blog is awesome. Thanks for the headsup on the paperback version. Think I will get it that way too. Have a wonderful Halloween! 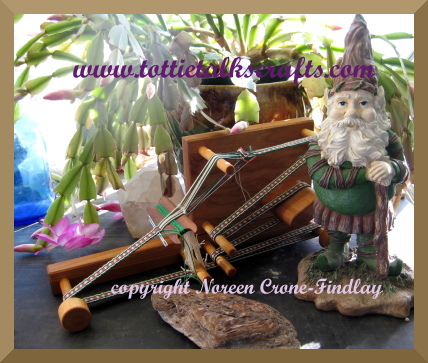 The mini inkle is a lovely little loom, and wonderfully portable- it’s a real pleasure. Sounds like you are having a blast with your weavettes!! !